A widespread search operation was underway Monday for 10 American sailors missing after their guided-missile destroyer collided with a larger oil tanker off Singapore. The USS John S. McCain is the second Navy ship in three months involved in a collision with a merchant ship from another country. The damage to the hull caused flooding to nearby rooms, including the crew's sleeping quarters and machinery and communications areas, according to the Navy. 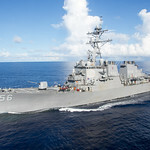 The guided missile destroyer is named for the Arizona’s senator’s father and grandfather, both of whom were admirals.